The Lilly Lash exclusive collection includes 3D Faux Mink Lashes, Cruelty Free 3D Mink Lashes, and Cruelty Free Luxury Mink Lashes. Their invisible bands are impossible to detect, and the brand’s revolutionary silk-like Faux Mink fibers perfectly mimic the luxurious look of “mink” but are 100% vegan and animal friendly. If you are wondering what the general perception of Lilly eyelashes is, you just need to scroll through the Lilly Lashes reviews. By almost all accounts, the customers of Lilly Ghalichi eyelashes seem to be thrilled with the end result. From rave reviews about how natural looking they are to ones commending them on the amazing quality of their products, the reviews speak for themselves. For those who love a good deal, there are plenty of Lilly Lashes coupons out there. By using Lilly Lashes discount codes or a Lilly Lashes promo code, you can get as much as 50% off some of the best Lilly Lashes products. Step 1: Prepare your look. First off you need to curl your real lashes. If you want to add mascara, you need to do so before applying your Lilly Lashes. Step 2: Apply your mascara. This step is optional – you don’t need to apply mascara since you will be wearing false lashes. But if you want some extra drama, apply mascara. Step 3: Pick your lashes. This is an important step because it will determine your “look.” Once you’ve selected your style, carefully remove them from the tray and then pull from the inner corner of the band of each lash, and then pull the rest of lash off. Never pull or grab on the lashes themselves, always pull on the band of the lash. Step 4: Once the lashes have been carefully removed from the tray, make sure to cut them to your eye size. Hold the lash up to your eye for sizing. In cases where the lash is longer than your natural eye shape, trim the lash accordingly. Always cut from the inner corner of the lash. Step 6: If you want to make applying the lashes a little easier, you may want to try a lash applicator. Lilly Lashes sell a great applicator to help make applying your lashes super easy. Step 7: Removing your lashes. When you are done with your false lashes, you can carefully remove them by pulling the strip off your eye, starting from the inner corner. There is a video tutorial available on the Lilly Lashes website to help you to perfectly apply your Lilly Ghalichi eyelashes and have you feeling like a pro in no time. But the applicator is a great tool to use as a newbie until you get comfortable and confident enough without it. The best Lilly Lashes are easy to apply and it shouldn’t take you too long to get the hang of it. 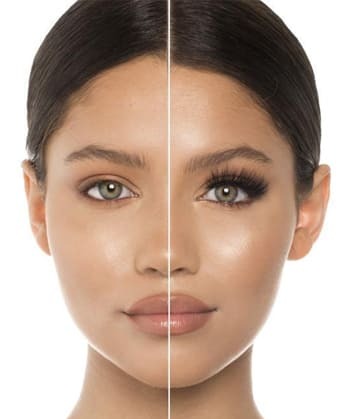 The 3D Mink line of Lilly Lashes is the most sought-after style and has been made popular by the likes of Kylie Jenner on her Instagram page. These are the lashes of choice for beauty fanatics who want to take their eye game to the next level. These ultra-wispy and rounded sets of false lashes are perfect for getting that Insta-worthy, glam finish. They are sure to add volume, length, and seduction to any look, and are still incredibly lightweight for comfortable wear. Possibly the most in demand of all the Lilly Lashes 3D Mink selections is the Lilly Lashes Miami style. These falsies are double stacked for extra impact and beauty – expect to really make heads turn. A wispy look is created by lash hairs that vary in length. The Miami Lilly lashes are a favorite among celebrities including Lady Gaga, Arianny Celeste, and Kim Kardashian. The Lilly Ghalichi Miami lash, however, isn’t the only one that will make heads turn. The Lilly Lashes Mykonos is a dramatic, choppy style lash that is among Lilly Lashes’s top three selling mink styles of all time. These are popular among celebrities like Pia Mia and Shantel Jackson. The most natural of the 3D Mink range is the Lilly Lash Doha style. The flared eye design adds just the right amount of volume and length and gradually increases from the inner eye to the outer edge for a flirty cat eye finish. With the perfect amount of length and an evenly distributed volume, these lashes ensure a natural fuller lash. For a similar but more dramatic look, you might want to try the Lilly Lashes Sydney style. These are perfect for adding an immensely fluttery winged finish to your eye. Another superb choice is the Lilly Lashes Paris style, which is a fun and flirty option that mimics the natural form of the lashes. The wispy wonder of these Lilly Lashes accentuates all eye shapes to create a sultry, winged look. Boasting a unique criss-cross pattern, these falsies blend seamlessly in with the natural hairs for an effortless and flawless appearance. The perfect choice for when you want to look red carpet ready is the Lilly Lashes Hollywood style, just as the name suggests. These super-fine mink hairs focus their length on the center of the band to deliver a wide-eyed, rounded, feminine look. If you’re searching for falsies that are a little more flirty, go for the Lilly Lashes NYC style. These have been dubbed as the embodiment of feminine glamour. With evenly distributed volume and enviable length, these carefully constructed mink hairs achieve the illusion of a naturally fuller lash that will leave your friends in awe. The Lilly lashes Cannes style is a totally unique and effortlessly chic look. Unassuming at first, you can expect a lash that adds instant flair to the eyes without being overly heavy or dramatic. The innovative variation of clusters offers spurts of depth and volume exactly where it’s needed. The Lilly Lashes Monaco style, on the other hand, is great for creating a baby-doll look. The unique formation of hair on these falsies focuses volume and length towards the center of the eye to create a wide-eyed, flawless finish. The Lilly Lashes Carmel style is a must-have evening lash. This is one of the fullest falsie sets that the brand has ever created. It is designed with plenty of length that gradually increases from the inner to outer corners of the eyes. It’s an ultra-black lash that is quintessential for adding a sultry finish to any look. If you’re looking for a whimsical, fluttery lash look, then the Lilly Lashes Ela style might be what you’re after. These weightless lashes, made with fine hair, have a subtle curl of varying lengths which focuses on the center of the eye, which creates a feminine, baby-doll finish to any eye look. The Lilly Lashes Lyla style is also ideal for the ultimate baby-doll look and adds a little more length and density than the comparable Ela style. The Lilly Lashes Goddess style has been seen worn by some of Hollywood’s biggest stars. These are ideal for getting that rounded, baby-doll lash look – but on the more natural side. The unique, crisscrossed pattern of thin and ultra light mink hairs mimics the natural lash formation, which allows the falsies to blend in seamlessly with your natural lashes, resulting in an effortlessly flawless, wispy lash look. If you’re looking for a lighter glam lash that is ideal for everyday wear, check out the Lilly Lashes Luxe style. 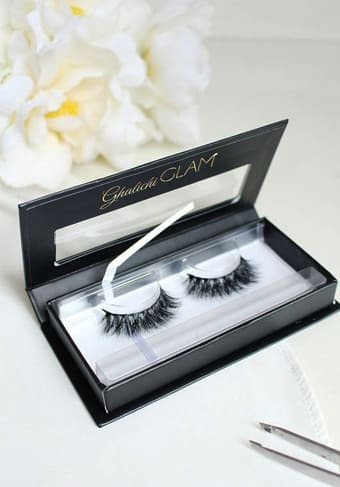 These will add a subtle flourish of volume and depth that mimics the appearance of the natural lash. They’re super lightweight and perfect for adding a gentle flare to the eyes. The Lilly Lashes Tease style, on the other hand, is a beautifully glamorous lash that is not too over the top. Jennifer Lopez has been seen wearing these on the red carpet. Varying lengths of wispy, fine, mink hairs are attached to an ultra-thin black band to create a sultry effect with plenty of added depth. These flirty and fluttery lashes are light and comfortable enough to wear all day. A wonderful option for a lash look that is more natural but still adds volume and length, is the Lilly Lashes Diamonds style. These are perfect for any eye shape and are one of the most natural falsie styles that are sold by Lilly Lashes. If long, wispy, round lashes are your thing, check out the Lilly Lashes Opulence style. These are designed to add a wide-eyed finish to your favorite look without being too full or dramatic. If you’re after something more dramatic, look into the Lilly Lashes Caviar style. These have been worn by Christina Aguilera and were designed to add a dramatic finish to any evening look. These ultra-black falsies have wispy fibers that blend naturally with your real eyelashes for a defined look. The Lilly Lashes Delara style can be found under the Faux Mink collection. These have been designed with subtle and multi-length hairs, perfect for adding an amped-up finish to your eyes. These lightweight fibers are attached to an invisible band and create a sultry and sophisticated finish. Now that you know everything there is to know about lashes by Lilly, you’re probably wondering where you can get your hands on these fabulous falsies. Well for starters, you might want to take a look at their online store. You can buy Lilly Lashes online from eBay, Amazon, and Beauty Bay, among a number of other stores. However, if you are going to buy your Lilly Lashes online, you’re best going directly through the store. Not only is it safer and more convenient, but you can get Lilly Lashes with free shipping when you spend $50 or more. If you want to purchase Lilly Lashes in store, they’re available to buy at various retailers and beauty studios across America. A few of these include Sacramento Makeup Design Studio in California, MASQ Beauty in Michigan and Jose Luis Salon in Texas. If you’re looking for a good deal, keep an eye out for the Lilly Lashes sample sale. They often have a sale online where you can pick up your favorite lashes with a 50% discount. Lilly Lashes are very much appreciated for having some of the best quality material and durability. With proper care and maintenance, Lilly Ghalichi herself said that you can use them between 25 and 30 times. But, if you want to them to retain their original freshness and ensure their durability, you need to clean the lashes after every use. While we’ve already addressed the issue of how to put on Lilly Lashes, you may be wondering; do Lilly Lashes come with glue? They don’t, but you can use any lash adhesive to apply your lashes. Keep in mind that it’s very important to know how to clean these falsies if you want to get the most out of wearing them. Step 1: Once your special occasion has come to an end or your day is over, it’s time to properly remove those false lashes so that they can live to see another day. Step 2: You can gently remove lashes by lifting the band of the lash off the skin at the inner corner of the eye. Then use that bit of the base to gently remove the remainder of the lash. You should never pull on the lash to remove it. Step 3: Repeat on the other eye. Step 4: Store your lashes carefully in the Lilly Lashes storage box that the falsies are sold with – keep them safe to use again. Lilly Lashes are extremely lovely, but unfortunately they are quite difficult to find. I wish that more places would stock this brand and that the brand started their own personal website. It’s rare that a brand can make both their faux mink and mink lashes really work and Lilly Lashes definitely pulls this off. These are flawless!! Goddess is just WOW.